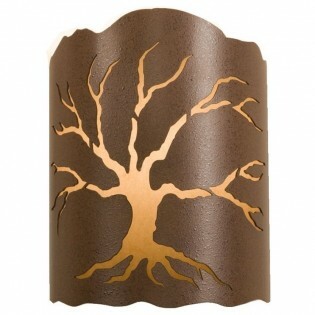 This rustic Living Tree Sconce is designed with a majestic tree cut into the metal with the light filtering through a white elephant hide paper liner. Made in the USA. This rustic Living Tree Sconce is designed with a majestic tree cut into the metal with the light filtering through a white elephant hide paper liner. This rustic cabin style sconce provides a soft ambient light with a single 60 watt bulb and measures 10.75" H x 8.5" W x 4.5" D.